Today I'll be reviewing Heartsong by Annie Douglass Lima. I received a free/reduced price copy of this book with no obligation to post a review. This adventurous science fiction novel follows thirteen-year-old Liz Smith, a quick-thinking, adaptable bookworm whose closest friend is her trusty e-reader. Within pages, Liz is hurtling towards an unknown planet, inexplicably separated from her own people. The novel describes her encounter with the natives of the planet she crash-lands on and the relationships she builds throughout her experience. My absolute favorite thing about this book was the entertaining writing style of the author. I loved how the imagery and sentence structure worked together to create a sense of atmosphere and scenery, whether that's the urgency and suspense of Liz being discovered by the Somavians or the warmth of their reaction to her. Another thing I loved was the kindness of the Somavians. In many science fiction novels, aliens are portrayed as evil or scary. But isn't it just as likely they would be generous and friendly? In Heartsong, the Somavians are exceptionally giving, helping to nurse Liz back to health and provide her with a home. It's more than could be said about humans if an alien suddenly landed on Earth. This novel also provides interesting parallels to life on Earth. At one point Liz ponders the existence of prejudice against her on Soma, saying, "It was a weird feeling, knowing people out there were prejudiced against me just because of what I was. I had never really been a victim of prejudice back on Earth..." This draws a clear connection between the violence and attitudes perpetrated against Liz on Soma and the experiences of many on Earth. Another parallel is the idea of a cross-cultural connection and both the difficulties and rewards that come with it. The language barrier, discovery of new customs and traditions, novel experiences and much more. My only criticism is the story starts out a bit slow, but it quickly picked up. Overall, I enjoyed this entertaining tale of adventure and discovery told from the viewpoint of an intelligent, relatable teenager. Hi guys! Today I'll be reviewing "40 Tips on Creative Writing" by Dan Buri. A few years ago, I reviewed his book Pieces like Pottery and really enjoyed it! Click here to read my review. "40 Tips on Creative Writing" is a guide through the journey of writing and publishing a book, specifically for indie or self-published authors. In Pieces like Pottery, one of the characters is given a list of 40 Tips for College and Life by his former high school teacher. Buri adapted these tips and incorporated them into the book. The 40 Tips were one of my favorite parts of Pieces like Pottery, so I thought it was very creative and interesting that Buri adapted them for this book. I know that some might immediately dismiss the book just because they aren't an author or they aren't planning on publishing a novel. While "40 Tips" is definitely a useful guide for beginning authors, many of the tips can also be applied to everyday life. You can even substitute writing for something else you want to accomplish. For example, Buri suggests setting aside a small block of time each day to focus on writing (Tip #3). But if you simply replace "writing" with "mastering an instrument" or "doing well in school," you can easily apply it to your own life. Some of the tips are deep and essential, such as Tip #6, "There is only one you." Buri writes, "Anyone who writes anything with passion and authenticity is more likely to captivate their audience, no matter how big or small that audience is." He then includes a beautiful insight, "All anyone can ever ask of us each day is to be the best possible version of yourself. That’s it. That’s all they can ask. And it’s all we can, and must ask of ourselves." One of my favorite parts of the book was when he gave advice for writers block. Writers block is something that plagues everybody, myself included. He gives six suggestions, all of which were super useful. The second half of the book contains lots of information that would be useful for someone wishing to publish their book, whether it's self-published or not. Another one of my favorite tips was #36: "There will come a time when you’re presented with decisions that compromise your values, know how you will respond before they happen." Buri effectively relates this to writing and publishing, but I can definitely see every-day applications, as I've faced this in my own life as well and being prepared would have made the decision a lot easier. Overall, I really liked the book! It was a relatively quick read and I thought all of the tips were useful. They're especially helpful if you're a beginning author, but if you aren't, you can still apply the tips to your everyday life! It's also a great motivator. Every day, after reading a few of the tips, I felt myself ready to accomplish everything I had to do that day. "But great writers are able to take the most mundane subjects and write marvelously about them." Today I'll be reviewing Sleep, Savannah, Sleep by Alistair Cross. Sleep, Savannah, Sleep focuses on Jason Crandall, a recent widower who uproots his life as a marketing agent in LA to move to sleepy Shadow Springs to become a massage therapist, bringing his son and daughter with him. It's not long till he crosses paths with Savannah Sturgess, "a beautiful socialite who has half the men in town dancing on tangled strings." But when Savannah goes missing, everyone is suspect, and Jason is suddenly ensnared in the secrets of Shadow Springs. I'm usually not one to read mystery novels, although I did pick up a novel or two of Nancy Drew as a little kid. So I was a bit skeptical of Sleep, Savannah, Sleep at first because I wasn't sure what to expect. By the end of the book, there was still a few things I wasn't so sure about it, but it definitely made a good impression on me for mystery novels. So first, I'll talk about my critiques of the novel. One of the things I noticed was there was a few well-worn cliches applied throughout the book. For example: The aggressive, muscly, jealous husband. The creepy witch woman. The old cat lady. The moody teenager. The beautiful. blonde girl who sleeps around. Another problem I had was with the mild misogyny found throughout the novel. I know many will dismiss it as "boys will be boys", but I've said this before and I'll say it again: just because a book has a male main character doesn't mean they have to be sexist, even if it's subtle. For example: "Jason glanced at the blonde, hoping she wasn't the gift. On the other hand..." and "Jason had to make conscious efforts not to ogle her." Okay, we get it. She's pretty, get over it. And at one point in the book, Jason tells Savannah how she should act and what she should do with her own body, which is a big no no and another cliche. My final issue is that the book sometimes violated the essential rule of writing: show, don't tell. What I mean by this is that throughout the book, the author tells the reader "she looked like trouble" or "he seemed suspicious", instead of showing these traits through actions or dialogue. If the author allows the reader to infer about characters rather than simply telling them, it creates a much better effect. Those critiques aside, the novel did manage to keep me entertained throughout the entire book. I liked how Savannah didn't disappear until halfway through the novel, which allowed the characters to be introduced and a sense of suspense to build beforehand. I also liked the use of the trial and conviction to make it seem as if the case was over, when really it had only begun. And, as I always do in mystery novels, I suspected everyone besides the actual murderer. Travis, Jason's love interest Hallie, Jason's friend Coop, even Jason himself. Everyone except for the murderer. The end of the book was shocking. To put it simply, I was shook. I won't spoil who did it, but the reveal was the best part of the book because it explained so much about that character that I had previously misunderstood. The anger issues, the lack of empathy, the frustration with Jason for pursuing the case, everything. Of all the characters, the murderer was the one I least expected but also the one who made the most sense. Overall, while I did have some issues with the book, I did really enjoy it and I suggest it to anyone who enjoys a good mystery, with some romance, family issues, and a bit of the supernatural. Finally, I'd like to thank the author for providing me with a copy of the book! It was an enjoyable read. It's been a while, but I'm back! Today I'm doing something a bit different: I'll be reviewing Thriftbooks, a website that sells used books for low prices. I heard about this website from a friend, who mentioned their dirt-cheap prices. To a consistently poor student, "cheap" is music to my ears. One of my favorite series is the Mortal Instruments series. I had four of the six books, but not the two middle ones, City of Fallen Angels and City of Lost Souls. I wasn't willing to dish out 15 bucks each to buy them from Amazon, especially since I've already read them, so I checked on Thriftbooks. It did not disappoint. I found City of Lost Souls for paperback in Very Good condition for $4. Sounds too good to be true? Just wait: I found City of Fallen Angels, also in Very Good condition, in hardback for $4.20! To make the deal even sweeter, Thriftbooks offers free shipping on orders over $10. I also ordered a Ranger Apprentice book I wanted (another one of my favorites), which brought my order to $12. And because I downloaded the app, I got a 15% off coupon, so I spent just over $10 for three books. Perfect. But the real question is: in what condition will the books arrive? For reference, here's the guide Thriftbooks provides for their rating system. Each book is rated in person by a Thriftbooks employee. * New: Just like it sounds. A brand-new, unused, unread copy in perfect condition. * Like New: An apparently unread copy in perfect condition. Dust cover is intact; pages are clean and are not marred by notes or folds of any kind. * Very Good: A copy that has been read, but remains in excellent condition. Pages are intact and are not marred by notes or highlighting, but may contain a neat previous owner name. The spine remains undamaged. * Good: A copy that has been read, but remains in clean condition. All pages are intact, and the cover is intact. The spine may show signs of wear. Pages can include limited notes and highlighting, and the copy can include "From the library of" labels or previous owner inscriptions. * Acceptable: A readable copy. All pages are intact, and the cover is intact (the dust cover may be missing). Pages can include considerable notes--in pen or highlighter--but the notes cannot obscure the text. * Thrift Deal: Items with a Thrift Deal tag are rated in at least 'Acceptable' condition (a readable copy, intact, and may include notes that do not obscure the text). Both of my Mortal Instruments books were rated as Very Good. I was super impressed when they arrived. ​They arrived in this nice teal package that, according to the website, is made of recycled paper, which is always nice. I can see why some people would be worried about books getting damaged, especially some of the more high-end books they sell (signed copies, rare books) because the packaging isn't much more than an envelope. My Mortal Instrument books and Ranger Apprentice book shipped separately, presumably because they were sold by different people. So keep in mind that if you're buying a lot of books, especially ones from different series, they could all ship separately. The Mortal Instruments books took 5 days to ship, which I think is pretty good for free shipping. As you can see, both books look to be in good condition. Honestly, I couldn't tell the books had even been used besides a few minor scuffs on the top part of City of Fallen Angels. I feel like the rating system was accurate. The books had been read, but they were basically undamaged. Just to provide an example of the condition of the books, this was really the only "damage" I could find, if it can be called that. Just a tad bit worn on the top, which is completely acceptable. I would recommend Thriftbooks for anyone who doesn't mind slightly worn books for super cheap prices. Of course, it has it's downsides. Obviously not every book is available, and you won't find a perfect deal for every book. I'm not sure if I would buy a book in Acceptable condition, just because I'd prefer it to not have highlighting or notes inside. But for me, finding three books for $10 is a deal any day. Another plus is that if your favorite series has a redesigned cover that you hate (like with the Mortal Instruments), it can be hard to find the books anywhere with the old cover. Thriftbooks is likely to have the older version. Overall, I was really happy with my experience with Thriftbooks. The books were super cheap, there was free shipping, and they arrived in almost perfect condition. I willl definitely be using Thriftbooks again. Hey guys! It's been forever! I've been super busy and haven't had a ton of time to read lately. 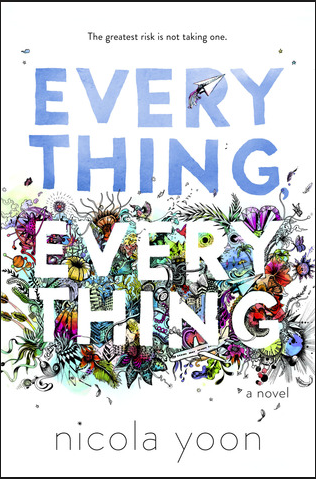 I saw an ad for a new movie based on a book called Everything, Everything. As soon as I watched it, I knew I had to read the book. Apparently I'm not the only one who had the idea because I'm currently number 12 on the hold list at the library. Luckily, I borrowed a copy from a friend. It's the classic boy next door story, but with one twist. The main character, Maddy, is so sick that she can't go outside. "Basically, I'm allergic to the world. Anything can trigger a bout of sickness...I don't leave my house, haven't left my house in 17 years. " She lives with her mother and her nurse in an environmentally controlled home, shut up inside with friends existing on the internet only. That is, until Olly moves in next door. In the movie, Maddy is played by Amandla Stenberg, aka Rue from the Hunger Games. Olly is played by Nick Robinson, who some may recognize as Zach from Jurassic World. The movie comes out May 19, so everyone head to their local library so you can read the book before the movie. No excuses. Maddy is extremely close with her mom, Pauline, and nurse, Carla, which is not surprising considering those are the only two people she knows. Her life involves daily checkups, games of Phonetic Scrabble, online classes, and movie nights. Anyone who wants to come in from the outside has to go through an extensive decontamination process, so most people aren't willing to visit. But then there's Olly. ​ "Then I see him. He’s tall, lean and wearing all black—black T-shirt, black jeans, black sneakers, and a black knit cap that covers his hair completely." Maddy is immediately transfixed by Olly. As one commenter put it, "a whiff of instalove." They soon begin to chat online, and things progress quickly. Within a few weeks, Carla lets Olly visit. If you're into halfway cheesy, halfway sweet teen romances, this book is for you. Olly and Maddy's relationship was cute, but I felt like it was slightly unrealistic. Their only contact was through IM, notes posted on windows, and the occasional meeting. I mean, yeah, Maddy can't really talk to Olly any other way. Call me cynical, but do you really think a high school guy is going to stay focused only on a girl he's never seen outside? Late night chats on the internet is not the same thing as walking the halls of a high school. That note aside, I DO like cheesy teen romances so I thought the dialogue and relationship between the two of them was adorable and sweet. Olly was thoughtful and funny, and the two seemed like the perfect pair. Olly changes Maddy's outlook on the world, whether for better or worse. As Maddy says, " Sometimes you do things for the right reasons and sometimes for the wrong ones and sometimes it's impossible to tell the difference." The book DOES have a huge plot twist. It was spoiled for me so I didn't have the shock that most people probably experienced. Without going into too much detail, I have to say that I have mixed feelings. It felt like a cop-out ending to a book that had the potential to be unique. The book also seemed to end quite abruptly, and an epilogue would have been greatly appreciated. Overall, I liked the book but it didn't live up to all my expectations. The romance was cute and the concept was interesting, but there wasn't much depth to Maddy's worldview. Rather than a sentimental, makes-you-think book, this book falls into the endless pit of teen romances, akin to The Fault in Our Stars. That said, I am planning to see the movie, and here's the trailer. This might be the first time I've said this, but maybe this story will be better suited as a beginning-of-summer chick flick. We'll see on May 19, but feel free to pick up this book in the meantime to pass a spring day or escape from the upcoming finals (good luck!). Hey guys! Today I'll be reviewing "The Eye of Nefertiti" by Maria Lusia Lang. I'd like to thank the author for providing me with a copy. 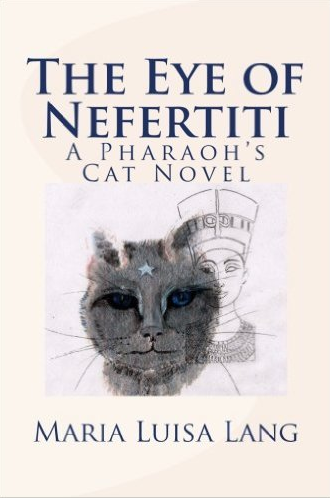 This novel is actually a companion/sequel to "The Pharaoh's Cat", but it functions as a standalone book as well. I didn't read "The Pharaoh's Cat" (although I'd love to whenever I'm a bit less busy!) but "The Eye of Nefertiti" wasn't confusing at all. There's a detailed summary of the first book at the beginning of this novel, making it understandable. The book follows Wrappa-Hamen, a cat blessed with the ability to speak and walk upright. Wrappa-Hamen is originally from ancient Egypt, but having a pharaoh as a best friend and access to a time-traveling boat has its benefits. He now lives in NYC in present day. HIs pharaoh friend was reincarnated as a baby, Alexander. The High Priest, also from ancient Egypt, and his wife Elena are the parents. Wrappa Hamen and the Gato Hamen (the High Priest) are best friends. Their relationship is super cute, pretty much a bromance. The story really gets rolling when Elena, an Egyptologist, is invited by to London to write a woman's book and live at her house in the meantime. If there's one thing I learned from this book, it was you shouldn't automatically accept a stranger's offer to come to her house in a different country to write her autobiography. Things will go wrong. In Wrappa-Hamen's case, he's sent on a wild adventure back to ancient Egypt. He gets drunk, gets chased by the police, catnapped by a child, falls in love, and overall has a crazy time. Oh, and there's a ton of cat puns. You can never go wrong with cat puns. This book also taught me about some intriguing parts of history, including the story of the missing eye of Nefertiti. These factual aspects of the book combined with the journey of a walking, talking cat make for an interesting story! If I had to choose one word for this book, it'd be cute. The story is relatively short at 200 pages and is mostly lighthearted. It was fun to read a book with a cat as a main character, and I could imagine one of my three cats getting into similar mishaps (hence the name of this blog, Paws and Paper). I would recommend this to anyone interested in Ancient Egypt, or history in general. It's a great read and doesn't take too long. In fact, if a time-traveling cat sounds interesting to you (and it should), pick up this book and turn some pages. The only complaint I have is that at times, it felt a bit rushed. It seemed like Wrappa-Hamen was always running out, with each scene only lasting a few pages. This was especially obvious near the conclusion of the book, where it felt jumpy and Wrappa-Hamen's sudden revaluation of love felt hollow. Besides that, I enjoyed this light-hearted novel about my favorite animal. Thank you to Ms. Lang for providing me with a copy. Hi, my name's Colleen and I'm a student who loves to read and write. My blog contains all things about books I read, and stories I write! Keep updated with an email for new posts!